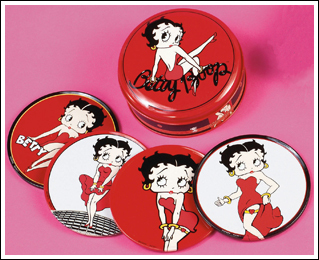 We love being able to add more wonderful Betty Boop goodies for your delight. Spice up your evening and have a drink with Betty with this set of coasters. There are 4 classic Betty poses on these cork-back enamel-on-metal coasters (2 packs of 4 each). Best of all, these coasters come in reusable decorative tins. We know you can’t resist.